When I went on my RTW trip in 2011, it required me to really think about what I would need to pack. 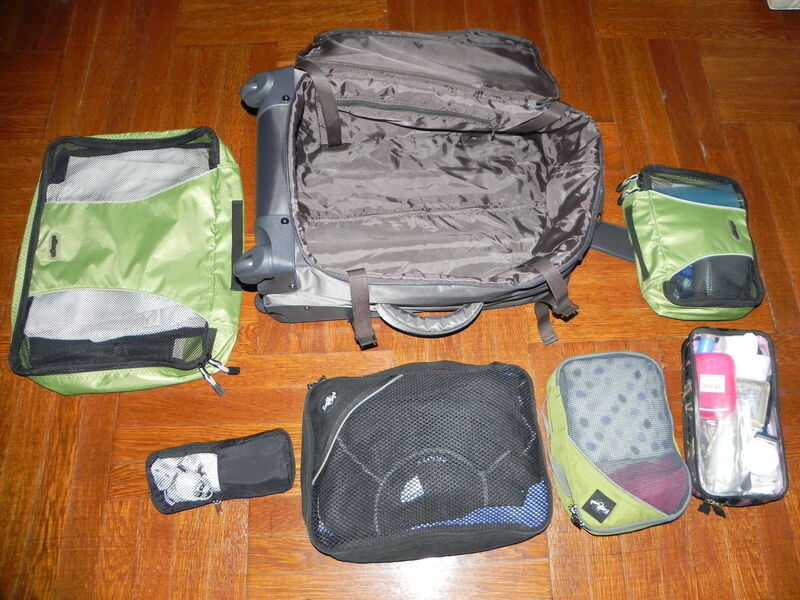 I studied websites (such as onebag.com) and was able to narrow it down to one medium sized rolling bag (too big to carry-on, but light enough to still be able to get around on subways and buses) and a medium sized backpack. However, while on that trip, I realized I could have survived on a lot less. So I continue to work on narrowing down my packing to true essentials. And now I want to share some of my packing tips with you. For purposes of this illustration, I am packing for an 8 day trip to Girona and Barcelona, Spain. I decided I wanted to get a new carry-on bag that I could use for trips of 1-2+ weeks (who knows…maybe it’s all I’ll need for any trip), so that I could save time at baggage claim, save the $25+/- per bag fee (each way) now charged by most airlines, and ensure that my bags arrive with me. While I have traveled to 42 countries over the course of my life, including some real adventures, I don’t really consider myself a “backpacker” in the true sense of the word. I still like to have a rolling bag, as I don’t want to hoist all of my gear on my back or shoulders. So I purchased the below 20” carry-on bag, which has the four wheels (which everyone has been raving about), but still only weighs about six pounds when empty. One thing to note is that this bag has no extra pockets or compartments, except on the front and back of the flap. I’ll use one of those for my dirty clothes. 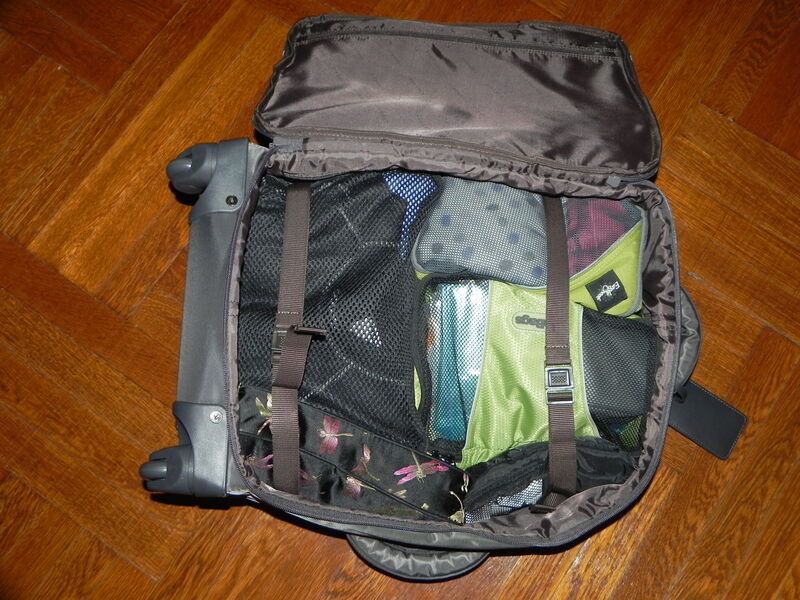 All of those extra compartments just take up space and add weight to the bag. Now I had to see if I could fit everything in it for this 8 day trip. In the medium black bag in the middle, I have my tops, including 2 t-shirts, 1 polo shirt, 1 dressy shirt, 1 long sleeved runners shirt (for cool evenings). My sleepwear and bathing suit are also in this bag. (Sometimes I just use my t-shirts for sleepwear). In one of the small green bags, I have my underwear (I like the quick dry kind from exofficio.com), socks and accessories (such as scarf, costume jewelry, etc). In the other small green bag, I have a bunch of miscellaneous stuff, including first aid items, exercise band, laundry sheets and sink stopper and hair items, including my little travel hair dryer (still can’t talk myself into leaving that behind). The see through bag in the bottom right hand corner has all of my non-liquid cosmetics and toiletries (I specifically like a bag that is see through so that I don’t have to dump everything out on the bed to find something). And the little black bag on the bottom left has all of my chargers and plugs (don’t need a converter as all of my electronics are dual voltage). Now it’s time to see if it fits in my new bag……..
…and, it does! What you can’t quite see in this photo is that there is still room on top for two shoe bags, although I’ll only need one extra pair for this trip, and I’ll wear my walking shoes on the plane. Total weight of bag, including shoes: 19 pounds. I also used a day backpack for this trip, in which I packed my camera, iPad, iPhone, medications/vitamins, quart bag with liquids, a sweater and a few energy bars. Total weight: 7 pounds. Ready to go! 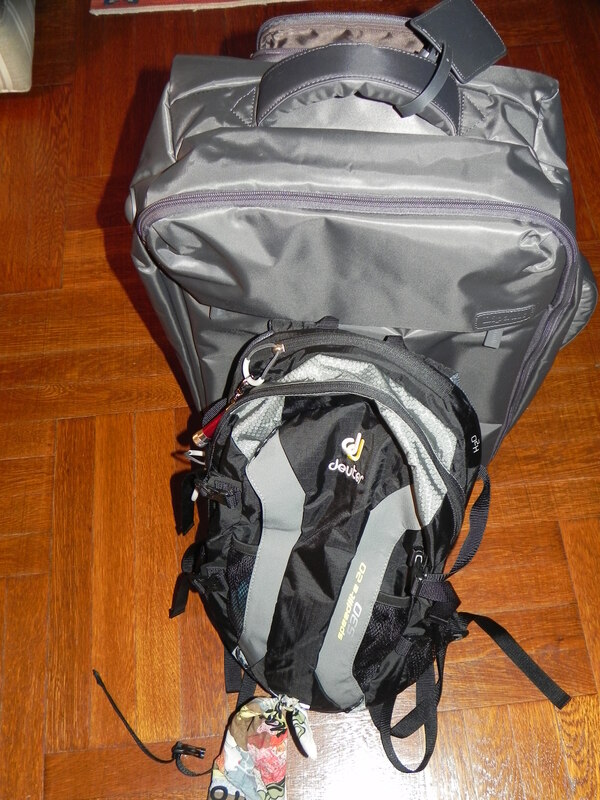 It may be more than many other seasoned travelers would pack, but for me it’s got to be half as much as I used to pack before I went on my RTW trip. I am ready to explore Costa Brava! 4 Responses to "Packing for Trip to Spain." Excellent packing tips. where did you get the backpack? what’s it called? It’s a Deuter, speedlite20, and I got it at Paragon at 18th and broadway in NYC. This will be the first time I’ve used it so I’ll let you know if I like it. I have the same mesh bags from ebags – they are the best thing ever! They make packing so much easier, and help keep things under control as you move from one place to the other. 19 lbs is pretty impressive, have a great time!